Considered one of the 10 best places in the United States for careers and #7 in job growth by Forbes Magazine, Nashville, Tennessee is an ideal location for someone with forklift certification. Nashville, TN, is most popularly known as the center of the music industry, (it’s even nicknamed “Music City”), but it is also a huge center for manufacturing, transportation and agriculture. 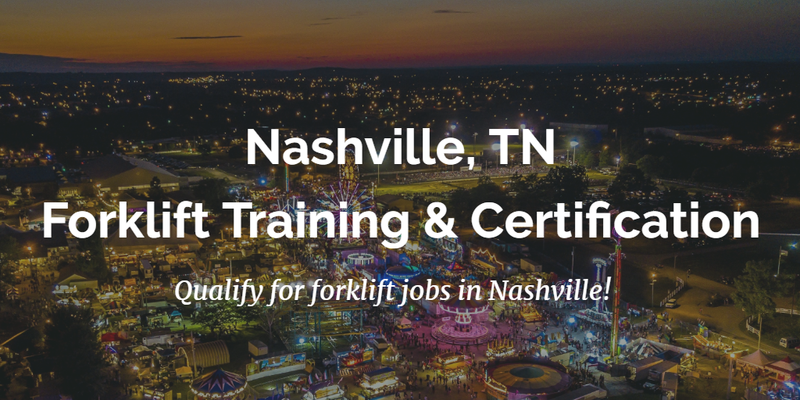 For those individuals with forklift training in Nashville, the sky is the limit with the number of job opportunities and well-paid positions, not to mention an excellent quality of life. In addition to offering plenty of excellent employment opportunities for those with forklift certification, Nashville, TN also offers tons of outdoor activities, cultural events, a beautiful climate, top-notch schools and more. When you head to Nashville TN for forklift certification, you’ll not only be opening yourself up to tremendous career opportunities, you’ll also find a wonderful place to make a home and build a family. All of our forklift training classes in Nashville, TN, are ideal for beginner drivers, veteran operators, and everyone in between. Plus, we also have a Train the Trainer course that explains how to become your company’s primary training resource. Many companies in Nashville and all over Tennessee use this course to save even more time and money in the long run! Whether you’re already familiar with the beauty and excitement of living in Tennessee or have yet to have the opportunity to visit the area, you’re in for a welcome dose of southern hospitality. 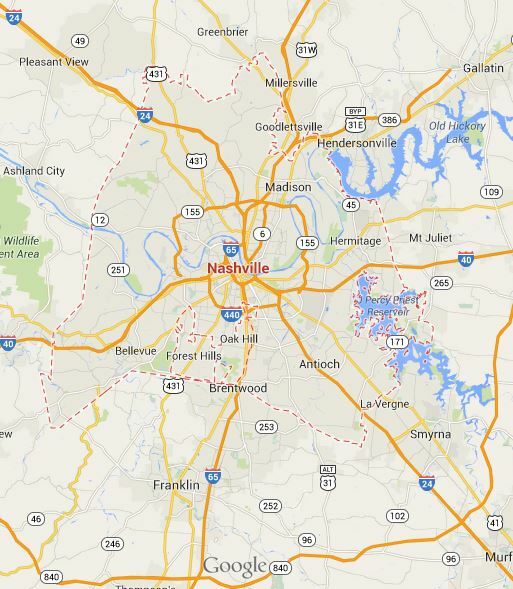 Full of friendly people, picturesque natural surroundings, and a vibrant city life, getting your forklift certification in Nashville, TN couldn’t be a more enticing prospect. With tons of employers across a wide spectrum of industries constantly looking for those with forklift training in Nashville, you’ll be able to find the dream job you’ve been looking for and an incredible place to start a home. Many employers offer a forklift training program in Nashville, whether they’re a small company or a major corporation with multiple locations. Whether you’re looking to work in manufacturing, construction, transportation, warehousing, agriculture, mining, or a variety of other industries, Nashville TN forklift certification can get you where you want to go. Additionally you can get individually forklift certification in Nashville TN with CertifyMe.net, which will put you ahead of the competition and make you a more attractive candidate for jobs in the area, as well as higher paid positions. Part of our rich, southern agricultural region, Nashville is a major center for processed foods coming in from farms all around the area. Processed foods such as grain products, bread, breakfast cereals, and flour along with beverages including beer and whiskey are the most important sectors of Tennessee’s manufacturing industry. For those with forklift training in Nashville TN, employers, including Dean Foods, are frequently looking for well-qualified applicants. Tennessee has also been frequently ranked as one of the top automobile manufacturing areas, offering jobs at plants for Volkswagen and Nissan, as well as many smaller facilities that serve the industry. Limestone deposits also provide the greatest portion of Tennessee’s mining economy in the form of crushed stone, used for building roads and producing cement, and offers many job possibilities. If you’re looking for a forklift training program, Nashville should definitely be on top of your list. Full of tremendous job opportunities, tons of culture (especially for country music fans), easy access to the great outdoors for sporting, and plenty of fun activities to keep you entertained, Nashville is an amazing place to work and live. Don’t hesitate with your forklift training classes in Nashville, TN. Sign up today! It’s easy to get started, and once you’re a CertifyMe.net customer (both employers and employees), you’ll enjoy lifetime support, exceptional value, and even FREE 3-year renewal training. For any questions about our flexible & affordable forklift training classes in Nashville, TN, call our OSHA experts today at 1-888-699-4800. Thanks for visiting CertifyMe.net!